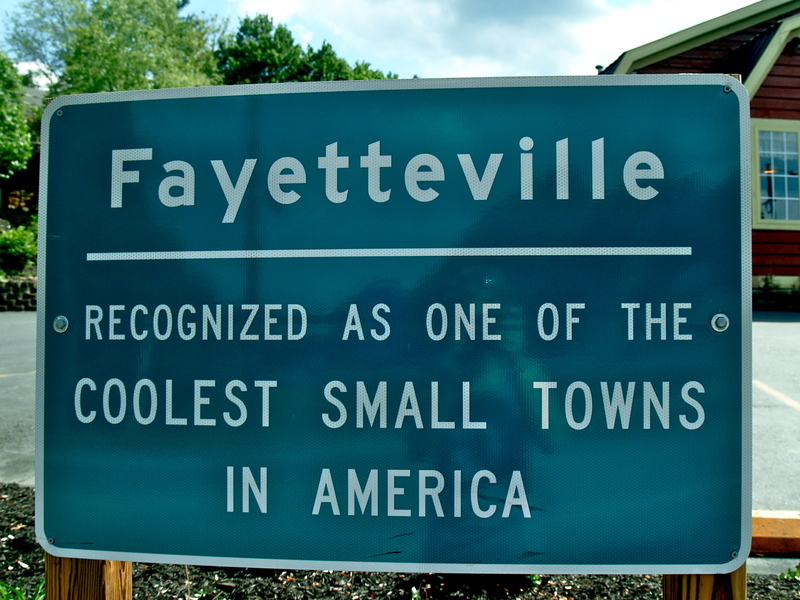 My dad grew up in one of the “Coolest Small Towns in the USA”: Fayetteville, West Virginia. When Budget Traveler magazine named Fayetteville one of the top ten small towns in the country, it credited not just the town’s young atmosphere and unique shops, but also the local geology, which is nothing short of spectacular. Fayetteville sits on the precipice of the New River Gorge, a 500-meter-deep trench carved by the raging New River through the Appalachian Mountains of southern West Virginia. Not only is Fayetteville cool and its gorge spectacular, but with the East Coast’s best rock climbing and world-class whitewater rafting, the New River Gorge might also be the most thrilling geology field trip on earth. The New River’s name is misleading, since it is thought to be one of the oldest rivers in the world, perhaps second only to the Nile. The New River began as an ancient river system known as the Teays, which was created 350 million years ago when Europe, Africa and North America collided to form the supercontinent Pangaea. The impact uplifted the Appalachian Mountains to Himalayan heights and the Teays formed to drain the range’s western slopes. From its headwaters in what is now North Carolina, the Teays journeyed north through the Virginias to Ohio, then turned west to drain into a vast inland sea that is now the site of the Mississippi River basin. 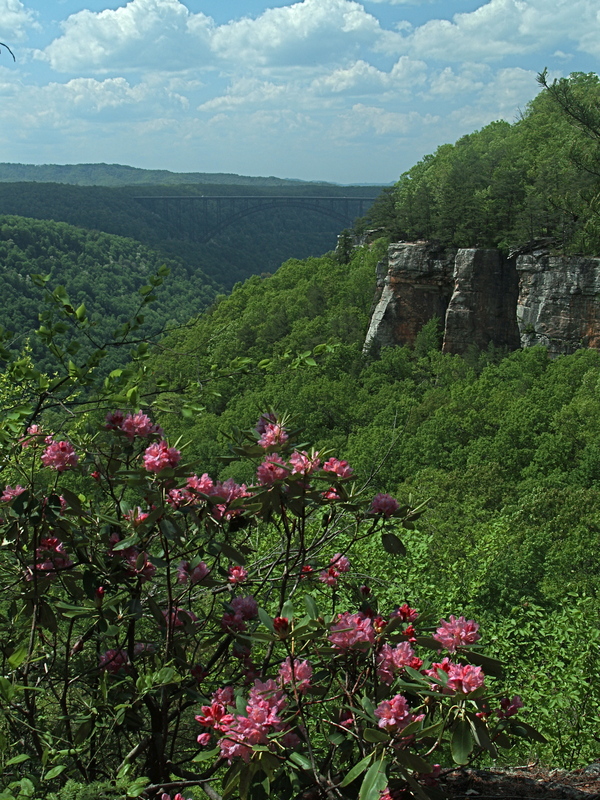 About 60 million years ago, West Virginia went through another period of gradual uplift. The swift-running Teays River cut into the mountain faster than the rate of uplift, thus maintaining its ancient course and creating the deep gorge seen today. 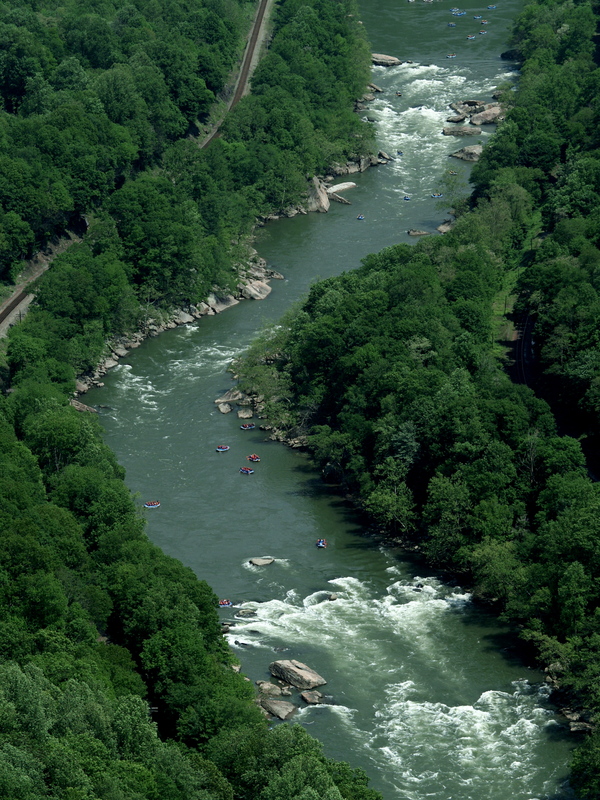 As it rushes through the gorge, the New River cuts through 350 million years of geologic history, exposing layer upon layer of sandstone, shale and carboniferous coal. Coal, formed from dead plants deposited 200 million years ago, has played a big role in the more recent history of the New River Gorge. 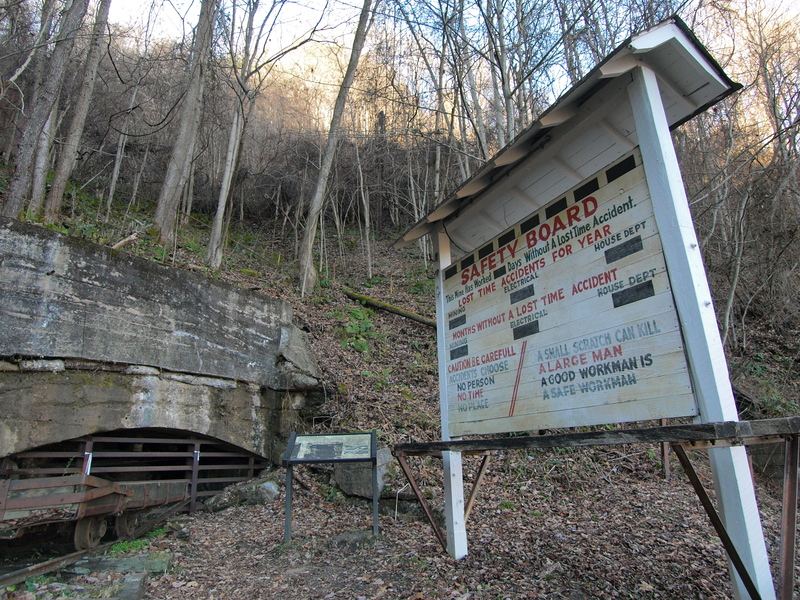 Because the river had already done most of the work to expose the coal seams, this area was one of the first places to be mined in West Virginia. The completion of a riverside railroad in 1873 opened the New River Valley to dozens of mining companies and thousands of workers. 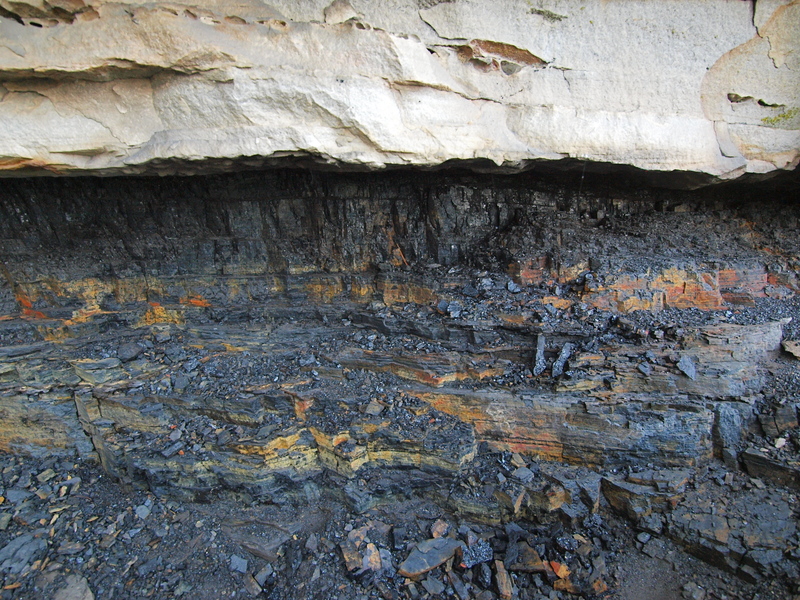 From 1900 to 1962, miners hacked more than 16 million tons of coal from the walls of the gorge. Coal isn’t the only famous rock in the gorge; its red sandstone cliffs are world-renowned among rock climbers. 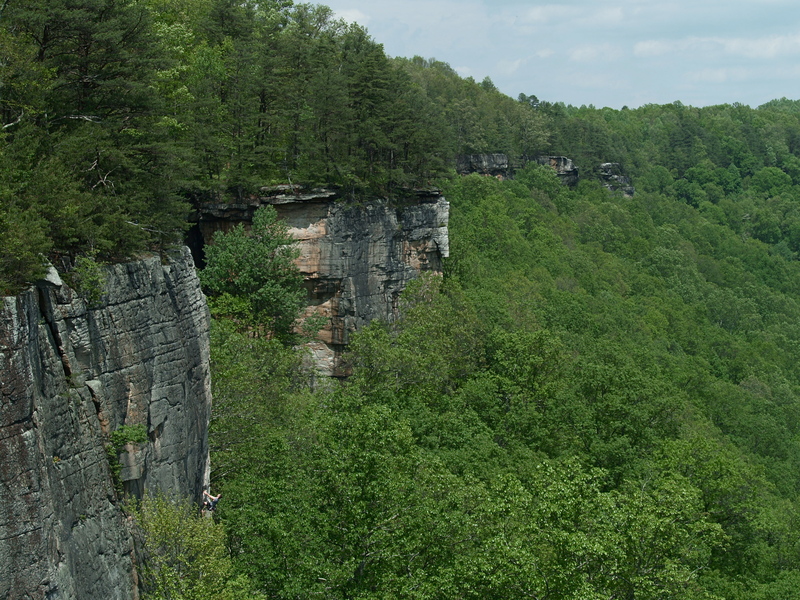 These sixty-meter high cliffs boast a climbing repertoire unmatched almost anywhere on earth. Thousands of climbing routes snake up the vertical rock faces and on any given day you can see some of the sport’s best rock stars tackling some of the world’s most challenging climbs. The best place to watch for climbers is from Diamond Point along the Endless Wall Trail, which is also possibly the best panoramic view of the gorge and a prime picnic spot. The New River’s Nuttall Sandstone cliffs are 98 percent quartz, perfect for finger-tip grips, and even better for forming a deep V-shaped gorge: The erosion-resistant rock is what makes the walls of the New River Gorge so steep. The gorge squeezes a lot of water down a narrow chute, making for extreme whitewater rapids that are not for the faint of heart. Much of the course consists of difficult class IV and V rapids, although there are sections and tributaries for rafters of all skill levels. Aside from the endless cliffs and rushing whitewater, the New River Gorge boasts another awe-inspiring feature: the New River Gorge Bridge. Travel from one side of the gorge to the other was once a harrowing 45 minute trip on a treacherous one-lane road, but the construction of the bridge in 1977 shortened the driving time to less than a minute. 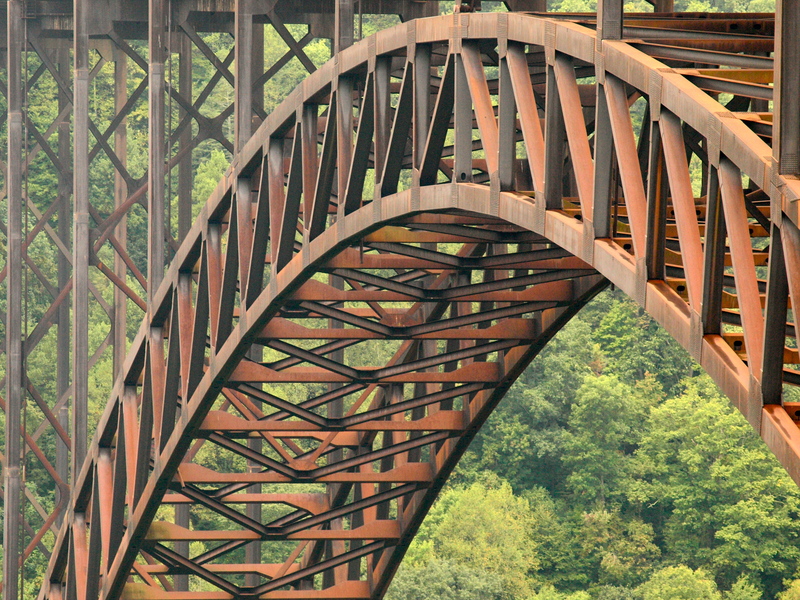 Towering a dizzying 292 meters above the river, the New River Gorge Bridge is the second highest bridge in the U.S. — and with a span of 566 meters, it is also the second longest steel arch span in the world. With those credentials the bridge attracts another breed of daredevil to Fayetteville: BASE jumpers. The BASE jumpers (an acronym for the four platforms from which they leap: Building, Antennae, Span and Earth) dive off a gangplank erected at the center of the span and deploy their parachutes in time to splash down in the river almost 300 meters below. Every October on “Bridge Day” the bridge is closed to traffic and opened to hundreds of parachutists and thousands of revelers. If you already have 50 jumps under your belt, you can register to leap, otherwise, peruse the 200 booths selling food and arts and crafts, and enjoy the daredevil entertainment and breathtaking fall foliage from the bridge. 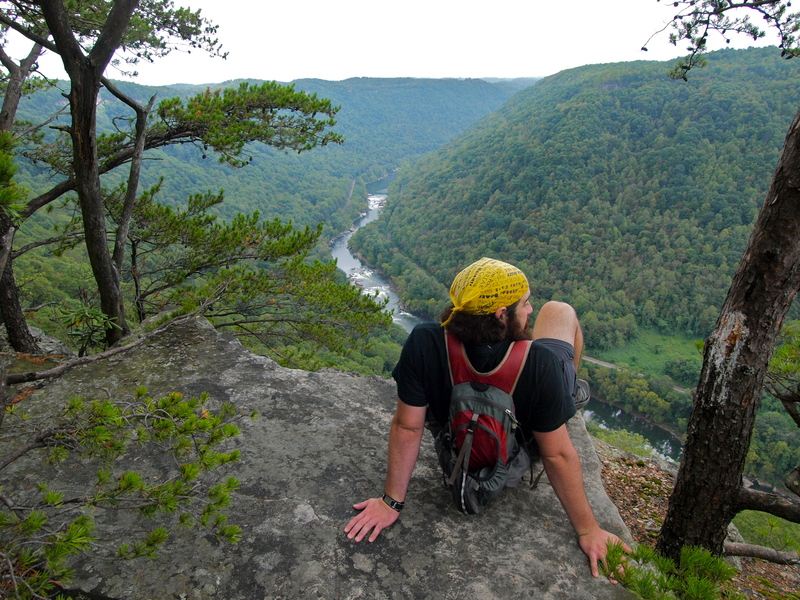 Sections of this post were sourced from my 2008 Travels in Geology column on Thrills and Spills in West Virginia’s New River Gorge for EARTH magazine. Also check out my New River climbing festival story for Climbing magazine: A Waste-Free New River Rendezvous? No Problem. 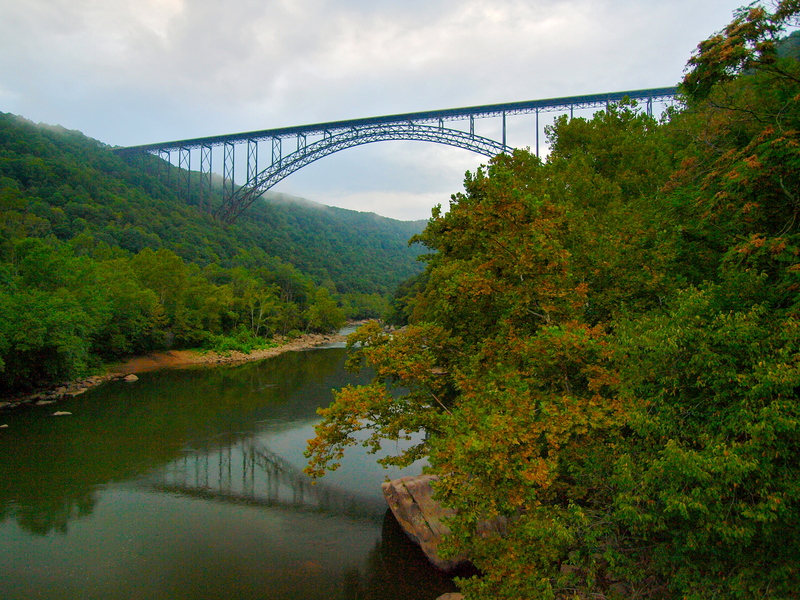 This entry was posted in Bowie & D.O.G., Hiking!, Photography, Uncategorized and tagged Bridge Day, New River Gorge, rock climbing. Bookmark the permalink. This place looks so breathtaking. I would love to live there for some years.